Fig. 1: Two grattoirs from Dudin, Plate 10. In 18th century French bookbinding, according to both Diderot and Dudin, these grattoirs (usually translated as scrapers) were used to aid in backing and smooth the spine linings. 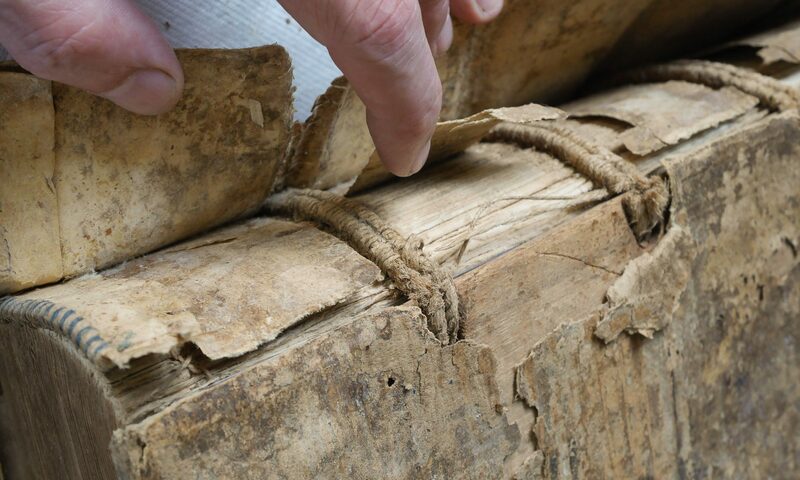 There were also frottoirs (versions with dents– pointed teeth) [*check comments for some discussion of these terms*] to scratch up the spine to get better adhesion, since book structures of this time period often had transverse vellum spine linings. I made a wood copy of the tool above on the left, but the light weight and friction from the wood made it awkward and ineffective; the friction would tend to tear the spinefolds and dislodge spine linings. There is a contemporary version, available commercially, which is even more useless due to the extreme round on the ends. I’m a little uncertain about these terms– so far the only reference I’ve found in English is in Diehl, where she refers to a wood frottoir ( burnisher? ), that looks a lot like the one still available. Fig. 2: Two 19th century frottoir/grattoirs, courtesy Ernst Rietzschel. This summer, I had a chance to test drive the combination frottoir/ grattoir tools pictured above. Ernst Rietzschel, from Holland, borrowed them from his bookbinding teacher in Belgium, so it is likely they come from the French binding tradition. Their weight, as well as the very slight curve, made it easy to concentrate pressure on just a signature of two for accurate manipulation of the spine. As an unexpected benefit, it was wildly cathartic to punch and scratch the spinefolds with the teeth, of course, only in the interests of historical research! I used the smooth, slightly rounded ends of the original tool to back the book and to align the cords as well as to burnish the spine linings. Even with the damaged edges and paint, I was surprised how easy it was to gently control the backing process and tweak the cords into alignment. I had much more control compared to using a hammer, and it was quicker (and potentially less damaging) than loading the spine with so much moisture that I could manipulate it with my fingers or a folder. Originally, I was planning to reproduce the original, but I didn’t want to make it out of iron because it is prone to rust. I wanted two smooth ends since I only scrape spines on specific historical models. I considered stainless steel, but didn’t have any on hand, and it is very gummy and difficult to work by stock reduction. Bronze was a good candidate, but brass is slightly harder. So I made a modern interpretation out of free machining, type 360 brass with a lignum vitae handles. The quarter inch thick brass and heavy wood handles give it a weight similar to the original, although the aesthetics are quite different. My version is 1.5 inches wide, 8 inches long and weighs 9.4 oz. ( 4 cm wide, 20 long, and 266 grams) In practice it works just as well, in not better, than the original. It can be grasped with a fist for extra pressure, or delicately held like a pencil for detailed manipulation. I wonder why a tool this useful would become virtually extinct? Fig. 3: A contemporary grattoir I designed and made. Jeff, hi! In my brain I ‚know’ why and how grattoirs/frottoirs work. But for my guts I wouldt like to watch a master working with this tool. Cant find any pic on youtube. Do you have any suggestion? No clue- this summer for the first time I used one in person. Crane’s “Bookbinding For Amateurs” from the 1880s, the first of the “modern” well-illustrated manuals, talks about and (I think) illustrates the pointed-tooth kind for roughing up the back. I’m not surprised that the toothed kind died out, it sounds pretty savage. I would guess that the hammer is faster in backing, if not as controlled or precise, and this would make a difference as industrialization speeded things up; also, a hammer may make it easier to get a high-regulation right-angle shoulder for use with square-edged boards, another change as the 19th century advanced. Some of the reshaping and tweaking functions would be doable with an ordinary bone folder. At least as late as Vaughan’s manual (1929), if I remember correctly, British trade-oriented manuals would describe “setting the spine” after the backed book had dried overnight: the book would be put in a strong press up to the new shoulders, the spine would be pasted, and after a while a folder would be used to scrape off extra glue and splinters from the lying press and backing boards, and to correct and improve the shape of the spine. I too find the commercial “frottoirs” to be of little use, but I think this is probably because I aim for a less rounded back; the commercial ones must be meant for a modern French back on 33% swell. I found, though, that by holding the tool at a lower angle to the spine, I could effectively reduce the curvature of the tool and make it more useful. In the end, though, I found them just not worth the effort of keeping track of. Thanks Tom- I’ll check my copy of Crane later. One thing I found in using the tool was that it was necessary to change the angle while working to keep from overly abrading the paper (although this was not a concern early on!) So the curve of the tool didn’t match any particular spine shape, but allowed it to be used vertically to the spine, to true up the cords, or somewhat flat when backing. etymologically, I think the terms are the other way round: “frottoir” is from the French verb “frotter” which means to rub, to burnish, etc. “Grattoir” is from “gratter”, meaning scrape, scratch, etc. So the one with the teeth should be the grattoir, the other one the frottoir. If you happen to have “Reliure” by Suen Evrard/Anny Persuy in your library, have a look at page 33 where “the small tools” are depicted; nr. 17 is the frottoir and the tool you see is one without pointed teeth but a wider dent on one end and a smaller one the other end. You are 100% correct. Now how/ when did these terms get mixed up? I wonder if it started with Diderot? Dudin, translated, seems to refer to both of them as “scrapers”; some with teeth, some without, but Diderot calls the ones with teeth “burnishers” and the smooth one a scraper. You know, the more I look at Diderot the more I wonder about who wrote some of his articles… I think most if not all of the bookbinding ones are not attributed to an author, and although I haven’t read anything I think is incorrect, there’s a lot that’s described so vaguely or quickly so as to be a little misleading at best. Jeff, hi: Visiting the biggest german book antiquarian in Dresden (http://www.zentralantiquariat.de/haupt.html) I discovered in an expensive anthology „Der Buchbinderlehrling, Nr. 7, 10. Jahrgang, 1937, pages 102 – 104” an interesting article. The „Chefredakteur” asked his readers: „Do you know this tool? presenting a sad pic of an iron frottoir/grattoir as seen above.” Most of the answers sound like „No Sir, but I knew one who knows one who worked with … etc”. Some old masterbinders answered too and described their experiences. An other readers letter warned about the use of „Kaschiereisen” because of the poor quality of „modern papers”. Since that – I think – german bookbinders use hammers peen for spine rounding.